A public outrage and cry rang out as people city of Fort Worth, Texas look on in horror and disbelief. 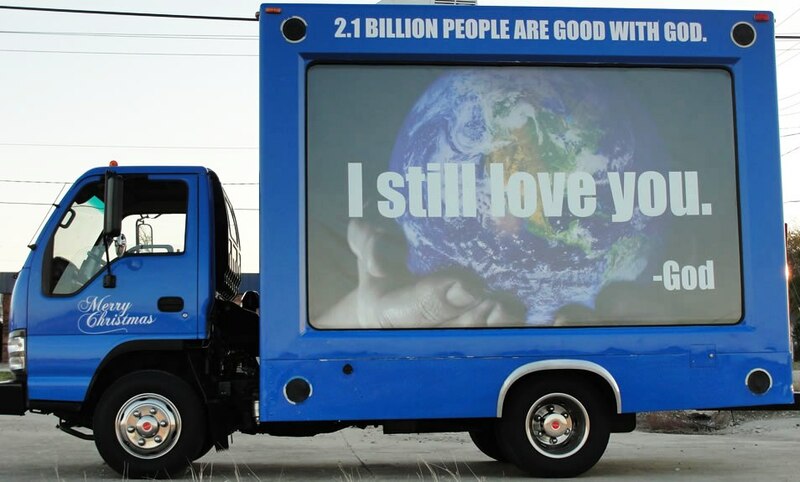 Buses pass by bearing a sign of disrespect to the Most High God, and the media had a field day as those who patronizing citizens watched their spiritual leaders gather to boycott in response to the advertisement brandished across public buses that read, “Good without God!” The mockery of which was seemingly a slap in the face for all who call on the name of God; words spewed out from among a local atheist group who say that man can do good, and behave himself in some moral fashion without God who created him. As a result the eruption of multitudes brought city transportation service to near standstill as patrons chose other forms of going to their destinations. Television viewers watched drivers refusal to transport passengers on those buses bearing those signs, and with lively-hoods threatened one has wonder how any good can come from man apart from God? The picture man paints as good is but a vain attempt at righteousness which brings forth pandemonium, and this certainly is not good. 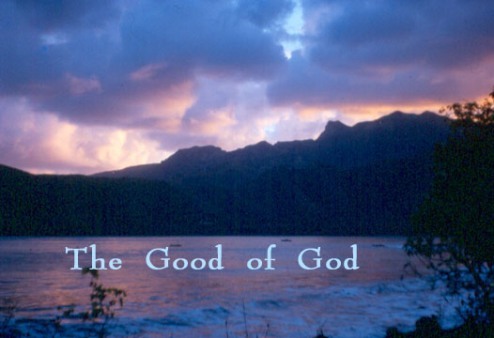 How can man be good with out God; when God who made man in His image, and fashioned man to be good connected to His spirit? The word of God gives an account of all He made since the beginning: “the day and night, the creeping and crawling things, the birds of the air, the beasts of the field, and male and female created He them, and looking back on all that He had made on the sixth day of the world’s existence He saying, “it is good!” (Genesis 1:1-31, KJV) How is it then that man who is made to be good with God has the audacity to say, “I am good without Him?” An insolent people will say that there is no God, and therefore will say that since there is no God then people can be good without Him. God thought ahead of man and said, “…the fool, the morally deficient being says in his heart, “there is no God.” They are corrupt, their deeds are vile; there is no one who does good.” (Psalms 14:1, NIV). Hence, there is not an ability to do right, or good continuously without a relationship with the Most High God who made man in His image. The skepticism of some has the world on God alert where the mere mention of His name brings forth the question “is it possible for man to be good without belief in God?” This thinking can’t be good, and Nielson says, “some argue that in a Godless world we have no grounds for being persons of goodwill, or doing what is morally required of us” (Nielson, K., 1982, pp. 335, Para 1). No morals is evident of no God, and a plausible reason why for some there is no will to do right, no caring for neighbors, brothers and certainly no hope. Neilson goes further to say, “it is–rightly or wrongly–widely believed now that no proof can be given of God’s existence and that it is not even the case that we can give evidence or grounds for the claim that it is probable that God exists…trying to do any of these things is frequently thought to be a confusion based of a misconception of the realities of Jewish and Christian belief.” (Nielson, K., 1982, pp. 335, Para 2). The misconception for non-believers of God is that anything good can come from man’s vain attempts at righteousness without Him; they are sorely lacking which shows forth confusion, aggravation, and frustration in its greatest display. What does it hurt to believe in a Power greater than oneself when it seems that man’s attempts at goodness have proved shameful to say the least? For a morally deficient man says it is good to steal if their children are hungry, and when caught will use that same pitiful excuse to escape punishment. What does man’s way reveal when so many face hunger daily all over the world; is man really good without God who promises to provide for those who love him?Neilson says, “A morally concerned human being will accept God humbly on faith, for without that faith and the belief in God which it entails, morality. Human integrity, and the basis of our self-respect will be undermined and life will be revealed as an utterly useless passion” (Nielson, K., 1982, pp. 335,336 Para 3). False gods and other worldly philosophies can be a critical key in a minds turning away from the righteousness and goodness of God, and the seeking after other relationship, and philosophies. The word of God says that man was created in His image so the question comes to mind that asks– how does man not believe in Him, or how can he ignore the evidence of those living things that he sees including himself? Confusion and bewilderment are wrought from a mind not sure of what it hears and this is not good. The word of God says, “For the wrath of God is revealed from heaven against all ungodliness and unrighteousness of men, who by their unrighteousness suppress the truth. For what can be known about God is plain to them, because God has shown it to them. For his invisible attributes, namely, his eternal power and divine nature have been clearly perceived ever since the creation of the world, in the things that have been made. So they are without excuse. For although they knew God, they did not honor him as God or give thanks to him, but they became futile in their thinking, and their foolish hearts were darkened. Claiming to be wise, they became fools” (Romans 1:18-23 ESV). Darwin says, “The fact that many false religions have spread over large portions of the earth like wild-fire had some weight on me. Beautiful as is the morality of the New Testament, it can hardly be denied that its perfection depends in part on the interpretation which we now put on metaphors and allegories.” (Darwin, C., 1809-1882, Para 2). Deep down in his heart of hearts man knows that God does exist, because he sees what God has made through nature; only a fool will deny the presence and existence of an Ultimate Being. It is obvious that the only God which requires honesty, righteousness, and encourages good is the one most hated. Hatred from whence did it come? Most certainly hatred is not good for anyone; neither the bearer of it nor the one who receives it. Surely, man cannot be good without God who made him. Charles Darwin in his autobiography said, “By further reflecting that the clearest evidence would be requisite to make any sane man believe in the miracles by which Christianity is supported, — that the more we know of the fixed laws of nature the more incredible do miracles become, — that the men at that time were ignorant and credulous to a degree almost incomprehensible by us, — that the Gospels cannot be proved to have been written simultaneous with the events, — that they differ in many important details, far too important as it seemed to me to be admitted as the usual inaccuracies of eyewitnesses; — by such reflections as these, which I give not as having the least noveltry or value, but as they influenced me, I gradually came to disbelieve in Christianity as a divine revelation.” (Darwin, C., 1809-1882, Para 2). Man thinks too much, and tries to figure things out too much; because the word of God requires belief in God to work. “For the law made nothing perfect, and a better hope is introduced, by which we draw near to God.” (Hebrews 7:19). Therefore, faith in God is not contingent on what is seen, but rather that which is hoped for. Only a fool says in his heart says that there is no God…Cohen writes, “Christianity is what is coined a “revealed” religion. That is, God himself revealed that religion to man. In other religions man sought God—some god—and eventually found him, or thought he did. In the case of Christianity God sought man and revealed himself to him. The revelation judging by after events was not very well done; for although a book made its appearance that was said to have been dictated or inspired by God so that man might know his will, yet ever since mankind has been in some doubt as to what God meant when he said it. Evidently, God’s way of making himself known by a revelation is not above criticism, there seems a want of sense in giving man a revelation he could not understand. It is like lecturing in Greek to an audience who understands nothing but Dutch.” (Cohen, C., 1868 – 1954, Para. 1). In his book “The origin of Species” concerning…Natural selection…Darwin’s discovery of creatures regenerating themselves dispels God from creation, and also gives those who say that the world is good without Him their so-called ammunition. Look at this: “Darwin’s great gift to science was to show how an explanation could be given for what had been described as the mystery of mysteries, the successive appearance of new species discernible in the fossil record. If new species could emerge from pre-existing species by a process of natural selection, it was no longer necessary to suppose there had been what Darwin called independent acts of creation. For atheists and scientific materialists the plausibility of Darwin’s theory was a particularly welcome gift because it could be used to dispel the notion of divine intervention in nature and to challenge the long-cherished belief that each species had been separately and meticulously designed by its Creator.”(Brooke, J. H., 2009, Para 1). Man thinks too much, and while “…Claiming to be wise, they became fools”(Romans 1:23, ESV). In conclusion, the book of Genesis also gives an account of the inner workings of creation by God and how He did so in just six days, and although to the natural more carnal eye of man this does seem incredible why doesn’t man have the ability to explain how creation took place or what entity allowed it other than God? The bible says that God created man in his image which is obviously a good image, because man sees himself as good; but the word declares that because of a sinful act by the man and woman sin entered the human race; thus an imperfect man exists today. (Genesis 1:1-31). Sexual lusts, hate, thieves, adulterers, robbers, murders and suffering such as poverty sometimes to an extreme degree, and with much more the suffering being a result of a disobedient heart as seen on the streets of life throughout the world. In homes, and on jobs unrighteousness, and a critical lack of goodness is evident presenting a particular challenge as to whether or not man can be good without God who made him to be good like Him. Is it wrong to murder because God says so, or as man deems necessary as/like in capital punishment is killing anyone good? Clark states, “But it does not follow that “being wrong “means only forbidden by God. That God forbids us to murder is for an excellent reason for not doing so: that is why it is wrong for us…” (Clark, Stephen R. L., 1982,pp. 340, Para. 4). The word of God says, “For my thoughts are not your thoughts, neither are your ways my ways, saith the LORD.” (Isaiah 55:8). Surely, it is correct to assume that God’s plan, and his ways are good; man cannot be good without Him. We have come around full circle, and it is here we note once more that “…the fool, the morally deficient being says in his heart, “There is no God.” They are corrupt, their deeds are vile; there is no one who does good.” (Psalms 14:1, NIV). No, there is not even one in the whole world. Brooke, J. H., 2009. Charles Darwin on Religion. Cohen, C., (1868 – 1954 ). Morality without God. Clark, Stephen R. L., (1982). GOD’S LAW AND MORALITY. Posted on September 14, 2012, in Children, Life, Marriage, Religion and Spirituality, spiritual, Work. Bookmark the permalink. Leave a comment.